32 y/o female who is 34 weeks pregnant, otherwise healthy, presenting for erythema and pain on her left lower extremity. She noticed this last night, and it started as a 3cm area on her left medial knee that was red. When she awoke this morning, it had spread further down her leg and behind her knee, and was much more painful. She denies any trauma or injury to the area. No history of abscesses or cellulitis. Denies fevers, other areas of erythema, chest pain, shortness of breath, numbness/tingling of her lower extremity. She still feels baby moving and no vaginal bleeding or any cramping/contractions. She went to an outside hospital where she had lab work which showed a WBC of 6k, elevated CRP, normal lactate. Blood cultures were drawn. She had a CT scan of her leg which was unremarkable, and a DVT study of her left leg which was negative for DVT. 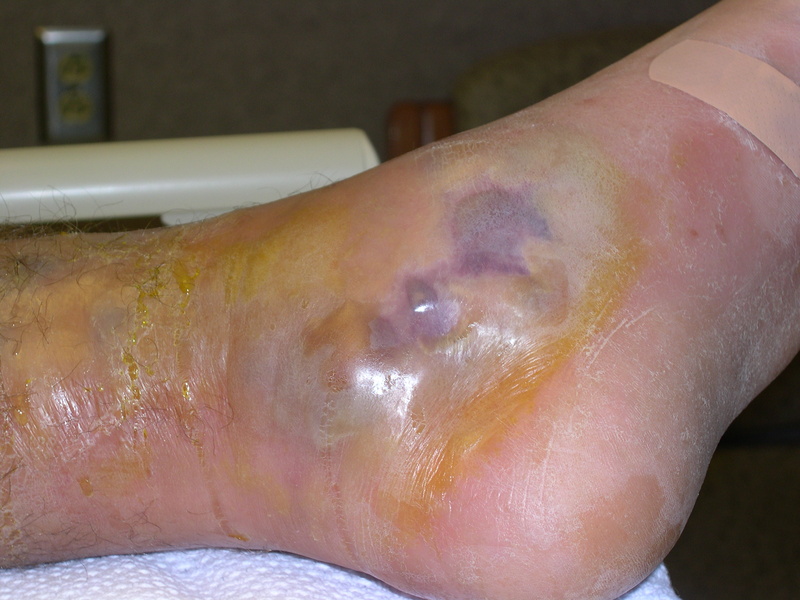 She was given vancomycin and zosyn and then she developed much worsening pain and on re-evaluation had spread of her erythema so was given clindamycin and transferred here for concern for necrotizing fasciitis. PE: afebrile, tachycardic in the 120’s, normotensive. CV: normal rate, regular rhythm. Extremities: she has 2+ pedal pulses. pain with movement of the left lower extremity, extreme pain with passive dorsiflexion. Skin: her left lower extremity has a 20cm area of erythema on the left medial knee, extending posteriorly behind the knee and both proximal and more distal. She cries and screams in pain with any palpation of this area. There is no crepitus. (The picture above is of our patient, she did provide consent for this as part of teaching but please do not disseminate outside of this email). Neuro: alert, oriented. light touch sensation grossly intact throughout the lower extremities. Concern for necrotizing fasciitis given her extreme pain out of proportion to examination, tachycardia, seemingly rapid spread of erythema on her leg. Orthopedics was emergently consulted and she went to the OR to r/o necrotizing fasciitis. Her lab work showed a WBC of 29k, lactate of 3.4. CRP and ESR were also sent but pending at time of patient going to OR. Of note, OB/GYN and L&D nurses were at the bedside for to place baby on toco and monitor fetal well-being. 1. Colin’s opinion—Correctly identifying this disease early and facilitating a quick trip to the OR is essential (but hard to do because it is uncommon). Mortality approaches 50-80% with a very high morbidity in survivors. Timeliness is more important in this disease than the timely identification and treatment of a CVA (7-10% mortality)…higher mortality than the timely identification and treatment of an MI (12-15% mortality), and higher mortality than garden-variety sepsis (up to 50% mortality). 2. 1000 cases per year…don’t miss yours! It is a clinical diagnosis, supported by some lab tests, imaging tests and scoring systems. 3. IN YOUR CAREER, YOU WILL SEE 6.02 X 1023 CASES OF CELLULITIS…THIS WILL ALMOST ALWAYS LOOK DIFFERENT THAN THOSE CASES IN SOME WAY! – Gestalt…T-JAR—This Just Ain’t Right…looks sicker or different than usual cellulitis. – Pain out of proportion to what you would expect. Very tender to exam. – Rapid spread of the cellulitic-appearing changes and edema. – A sick-looking patient (they will quickly get there). Early, they don’t usually look septic! – Skin changes with blebs and blisters…a later finding. – Snap-crackle-pop: Gas in the tissues—a late finding AND absent in most patients! Only a max of 30% may have it. It is often absent on xray. What does this mean…absence of gas DOES NOT exclude the diagnosis! Be sure to point this out to your consultants! 6. First-line anti-NF therapy is steel! ABX are a very good thing to do…but REMEMBER they will NEVER save a life or limb in an NF patient. 7. HBO therapy is adjunctive AFTER surgery. – Type 1 (~75-85% of cases) is polymicrobial—these occur in unhealthy, immunocompromised people! DM, RF, PVD, HIV, ETOHic, penetrating trauma, etc. – Type 2 is monomicrobial (15 or so%)—Strep pyogenes!! Happens in young healthy people! Sp is not usually a gas-former! 9. CT is 80% sensitive for finding NF. MRI is 90-100% sensitive but limited by a lower specificity and difficulty in getting it in a very sick patient. 10. Scoring systems can help in equivocal cases. 11. No one wants to own this disease! Not clear in many places who will take these patients to the OR…ortho or surgery. Varies by hospital. FIND OUT WHO DOES WHAT AT YOUR FUTURE PLACE OF EMPLOYMENT. Here (OSU), isolated limb is ortho and perineal or truncal involvement usually adds surgery to the mix. Next > nightmare airway . . .